Creamy dark chocolate used to dip your favorites into. Try strawberries, bananas, marshmallows, graham crackers, pretzels or pound cake. The possibilities are endless and delicious. This will become a new traction in your household. 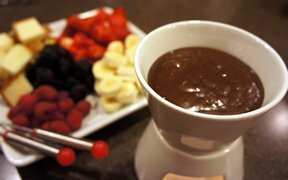 Combine chocolate and cream in a fondue pan or small heavy saucepan. Heat gently until melted, stirring frequently. 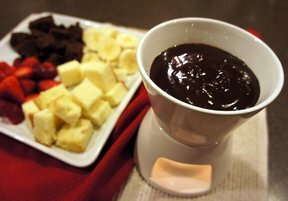 Stir the butter into the fondue until melted. 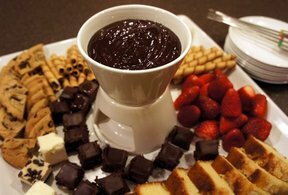 Place fondue pot or pan over a buffet burner. Arrange the fruit and cake for dipping on a large platter. 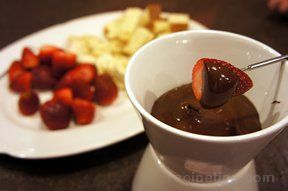 Spear the items of choice on fondue forks and swirl them in the dip until coated.